The potential to realize a working, scalable quantum computer has attracted serious attention from several areas of physics. Much of this attention has been devoted to studying quantum bits (qubits) which are the building blocks of a computer. A qubit is the analogue of a classical bit, but unlike its classical counterpart, the quantum bit may be in a superposition of states. One could, theoretically, make use of this property of superposition to perform certain computations that are intractable on a classical computer. Since a qubit may be in a superposition of states it can perform many different operations in parallel. It is therefore not surprising that many researchers are exploring a plethora of realizations of qubits, including superconducting qubits, optical qubits, and spin qubits. GaAs spin qubits are an attractive platform for realizing solid state quantum computers, chiefly due to the promise of scalability due to the advanced state of semiconductor process technology. To date, single qubits of this form have been studied and understood, and multiple-qubit experiments are under way. An effort being led by two groups at Harvard University is bringing together top researchers from leading universities around the world to prove the potential for these semiconductor qubits to form a scalable basis for quantum computing by constructing many-qubit devices. With a fast development timeline and a steep growth rate for the number of qubits to be made, the project requires speedy development of world-class test and measurement setups with enough flexibility to explore different approaches for manipulating semiconductor qubits. The ability of industry leaders in RF and microwave test and measurement to fill these needs ably and quickly is key to the success of the effort. The diagram above shows a typical experimental setup. Each pair of electrons (represented by red dots) represents one qubit, whose state can be determined by measuring the current through the charge sensors (black arrows). This current is measured at about 200 MHz using a microwave reflectometry technique with a bandwidth of about 10 MHz. 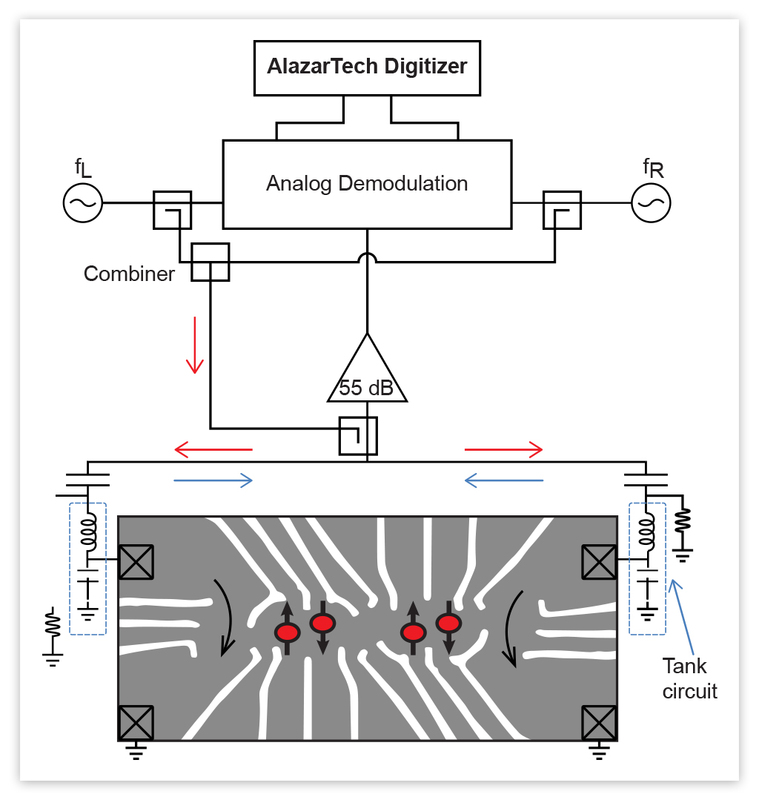 The demodulated signal is fed into an AlazarTech digitizer. Each of its two input channels reads one qubit, whose signals are distinguished via frequency multiplexing. The control pulses applied to the qubit (not shown) are synchronized with the data acquisition by using a common trigger and 10 MHz clock. 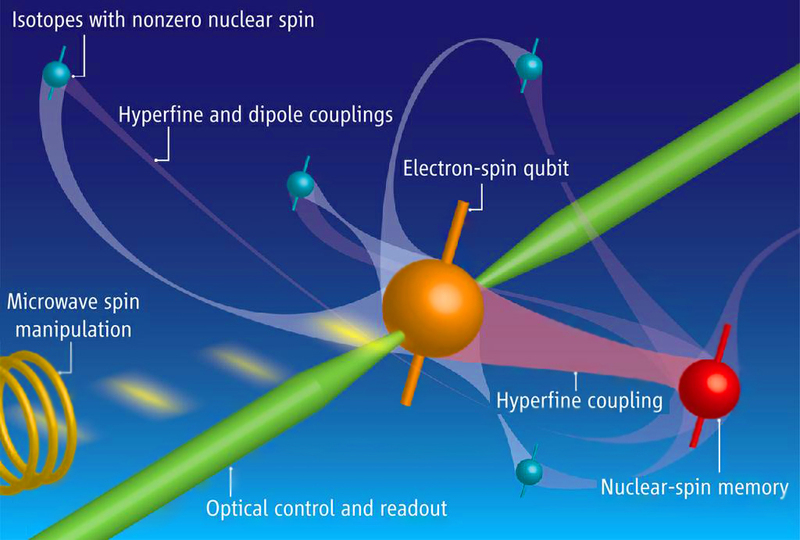 Spin qubit research is unique in that a single “experiment” takes approximately 1 microsecond, and must be repeated many times. Each “experiment” comprises two phases: a manipulation phase, in which some trial operation is performed on the qubit, and a readout phase in which detectors are turned on and the result of the measurement is read out as an analog voltage. To mitigate the effects of low frequency noise, experiments are typically interleaved, performing a series of different manipulations and readouts each once in a series that typically lasts roughly a millisecond, and then repeating the series several hundred times to acquire statistics. Sensor bandwidths are currently typically of the order 20 Mhz. For calibration purposes it is sometimes valuable to store the complete time trace during a several hundred nanosecond readout window, but more typically the quantities of interest would are the mean value of several sensor voltages over overlapping windows of time ranging from a few nanoseconds to a few microseconds. In “single shot” mode, the mean value of this voltage would be recorded for each individual experiment, while in averaged acquisition the voltage would be further averaged between repetitions of the experiment along with correlations between the voltages on different channels. Due to the exploratory nature of these measurements the details of the acquisition patterns change quickly and dramatically. A wide variety of measurements need to be mixed together: time domain traces, periodic single-shot measurements similar to what a boxcar averager would provide but interleaved both in time and between multiple channels in complex fashions, and real-time computation of correlation coefficients between multiple channels. In several instances, measured signals need to immediately be analyzed and results fed back into the experiment with a minimum of latency. All of these measurements need to be accomplished with as near to zero dead time as possible. The AlazarTech data acquisition cards provide an ideal solution A single card can perform all of these measurements, and because the analysis is handled by the host CPU, there is remarkable flexibility in our real-time data analysis as well as the ability to rapidly prototype new experiments using the AlazarTech DAQ card in MATLAB. Because the data is streamed real-time over the high speed PCI-express bus, latency and dead time are minimized while still providing ample measurement bandwidth for even the largest quantum devices proposed in this collaboration. Finally, because the DAQ card can be synchronized to an external clocked shared between all of the equipment in the experiment, including RF switches and arbitrary waveform generators used to generate control signals, it is possible to run long experiments uninterrupted by trigger and synchronization signals.